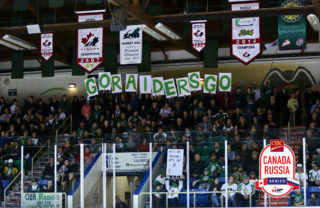 Prince Albert, SK – The Prince Albert Raiders’ Belarusian imports led the way in a 6-4 win over the Red Deer Rebels in Game 2 of the best-of-seven Round 1 series of the 2019 WHL Playoffs at the Art Hauser Centre on Saturday night. 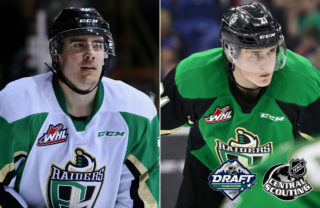 Aliaksei Protas and Sergei Sapego each had two goals and an assist in the win that gave the Raiders a 2-0 advantage in the series. Dante Hannoun also had a big game with three assists. The Belarusians dominated the first period for the Raiders. Protas opened the scoring 6:08 into the contest. Dante Hannoun recovered a puck in the slot and dropped it for the Belarusian rookie. Protas fired a slot from the high slot that beat Ethan Anders to make it 1-0. Less than three minutes later, Sapego put the Raiders up 2-0 on the power play. His wrist shot from the point got through traffic in front of Anders and into the back of the net for his first of the post-season at the 8:32 mark. With 5:05 to play in the first, the Rebels scored their first goal of the series. Chris Douglas redirected Ethan Sakowich’s pass past Ian Scott on the power play, bringing Red Deer back within one. Before the end of the period, the Raiders restored their two-goal lead. Sergei Sapego’s cross-ice pass attempt to Dante Hannoun hit Carson Sass and went past Anders with 3:41 to play in the first period. Early in the second, the Raiders lost a key piece of the roster for the rest of the game. Brett Leason was given a major and a game misconduct for a checking from behind penalty on a hit to Cameron Hausinger. On the ensuing major power play, the Rebels got back within one on Brandon Hagel’s first of the game. He skated from the corner to the bottom of the faceoff circle and snapped a shot past Scott from in tight at the 8:00 mark of the frame. Exactly one minute later and after the major penalty had expired, Hagel was credited with his second of the game. Jacob Herauf’s point shot was going wide of the net, but it hit Hagel and floated past Scott to tie the game at 3-3. Brayden Pachal put the Raiders ahead again with 8:46 to play in the middle frame. He cut off a clearing attempt and put a wrist shot on goal. The puck found its way through traffic in front of the net and past Anders to make it a 4-3 game. 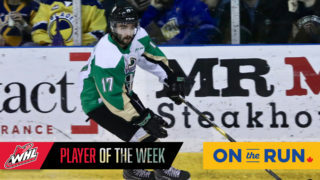 Before the end of the period, the Raiders had a chance to get another goal when Jeremy Masella was hauled down on a breakaway after he was sprung when he got out of the penalty box. However, Masella was turned aside by Anders with 5:32 left in the second. Protas struck again 2:08 into the third period to extend the Raiders’ lead. On a rush into the zone, Noah Gregor dropped a pass for the Belarusian import. Protas put a shot on net that was stopped, but trickled past Anders. The Raiders rookie got his stick on the puck behind the net and tucked in his second of the game to give his team a 5-3 lead. Another Raiders rookie gave the Raiders a three-goal lead at the 7:47 mark. Spencer Moe picked up a puck in the slot and found Ozzy Wiesblatt at the right faceoff circle. Wiesblatt skated into a pass and beat Anders for his second of the post-season, giving the Raiders a 6-3 lead. Midway through the third, the Rebels struck again to get back within two. Hagel directed Dawson Barteaux’s past Scott for his third goal and second power-play marker of the game with 9:36 to play. It was close as the Rebels came for the rest of the game. 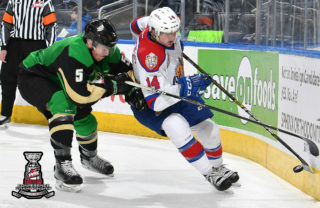 The Raiders were able to draw two penalties late in the third to damper any chance of a comeback from their opponents as tensions between the teams escalated. Scott finished the game with 19 saves in the win for the Raiders. 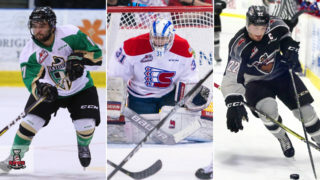 Anders made 25 saves for the Rebels in the loss. 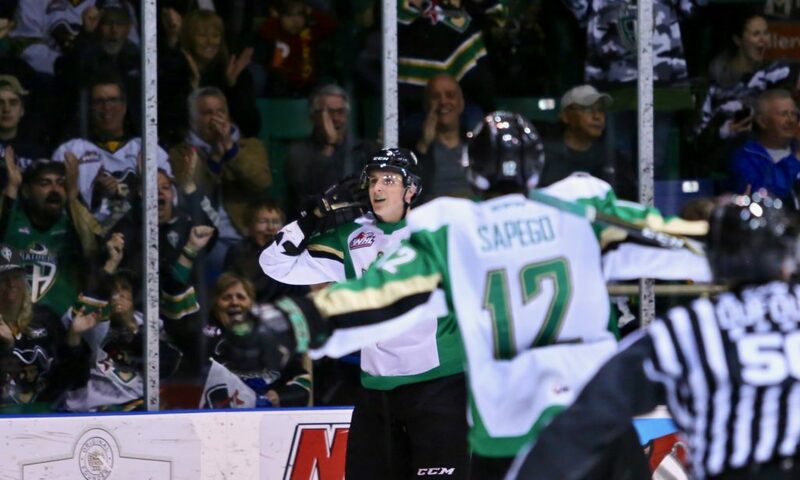 The series now shifts to Red Deer for Game 3 at The Centrium on Tuesday night. 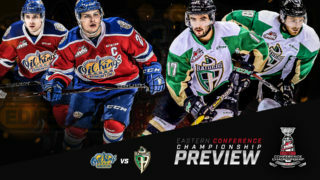 Puck drop is 7 p.m. Head to The Rock And Iron Sports Bar to watch the game, or listen to Trevor Redden on 900 CKBI.